While some iPhone 4 customers have started receiving their new phones—including some Macworld editors—Apple’s latest smartphone doesn’t officially go on sale until Thursday morning. That’s not the case with one piece of software designed for that phone: iMovie for iPhone appeared on the App Store late Wednesday night. The app takes many of the features of Apple’s desktop video-editing software and brings them to the iPhone. So extensive are the features, in fact, that the mobile version of iMovie will only run on the iPhone 4 and that phone’s more powerful A4 processor. 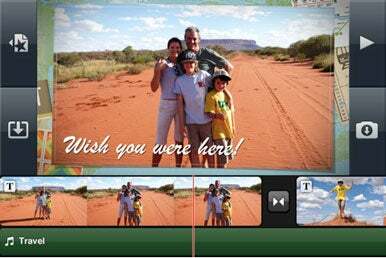 Introduced two weeks ago at the Worldwide Developers Conference, iMovie greatly expands the limited video-editing features previously found on the iPhone 3GS. Users could trim footage shot with that phone’s video camera and share the finished product via e-mail, MMS, or the Web, but that was about it. iMovie for iPhone promises substantially more capabilities. Users can trim clips with the help of drag handles, zooming in for finer edits. iPhone 4-toting Spielbergs can also add cross-fade or theme-based transitions as well as titles. The app also lets users add canned music that comes with each project theme or songs stored in the iTunes library. And users can insert still images from their photo libraries into a project, tweaking the pan-and-scan Ken Burns Effect to their liking. Delivery options for sharing videos remain the same, but users will be able to export movies at 360p, 540p, or 720p resolutions. Those features do not make for a slender app. iMovie for iPhone is a 30.6MB download from the App Store. The app costs $5 and runs on iOS 4—fitting, since that’s the OS that ships on the iPhone 4. Look for a hands-on with iMovie for iPhone—and a full review of the mobile app—soon.